Monthly Card Grand Release! Up to 30,000 Realmgems Return! 1. Reach required amount on a single recharge to activate Monthly Premium. Log on daily to receive return bonus. Lasts 30 days. 2. 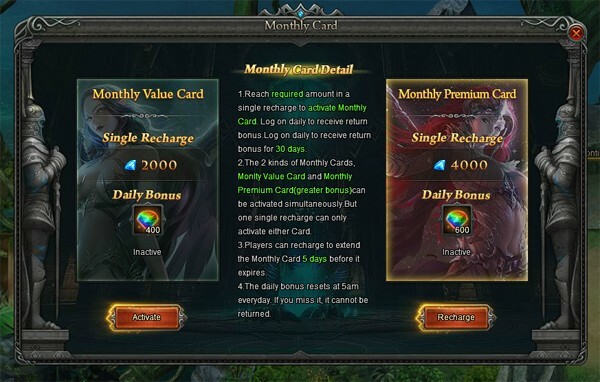 Monthly Cards are separated into Monlty Value Card (2000 Diamond) and Monthly Premium Card (4000 Diamond), the more you recharge, greater the return bonus. Only 1 type of Monthly Card can be active at one time. 3. Players can recharge for current Monthly Card 5 days before it expires. When recharging, players may choose the current card or another card (if a new card is chosen, the new return bonus is available when current card expires). 4. Player can not claim missed daily return bonuses.